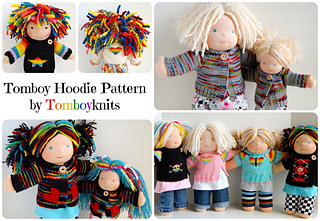 Here’s a fun pattern for two different styles of hoodie to fit 9”, 10”, Skinny 12”, 14”, Petite 15”, 15-16” waldorf-style dolls. Please feel free to sell your finished garments, with pattern credit to Tomboyknits if you don’t mind. Be sure to check out the free Tomboy Pockets pattern for little square and heart-shaped pockets - they look super cute on these hoodies! The Tomboy Hoodie is a modified version of the free pattern “The Hoodee for your Bamboletta”, and I am eternally grateful to Ingrid for giving me permission to release and sell my version of it! Thanks, Ingrid!